Antamedia HotSpot Billing Software is Windows PC gateway software which enables control and charging for Internet access using captive portal technology. This software is suitable for all purposes where customers should get fast login to system without Client software installations. Upon connecting to network (using wireless cards or UTP cable), customer will be prompted to type username and password to get access to Internet. Customer will see their time and bandwidth usage and will be able to refill their time when needed. Our HotSpot solution works with any active and passive network hardware. You are not required to buy specific access point models and in many cases not even required to reconfigure your network. 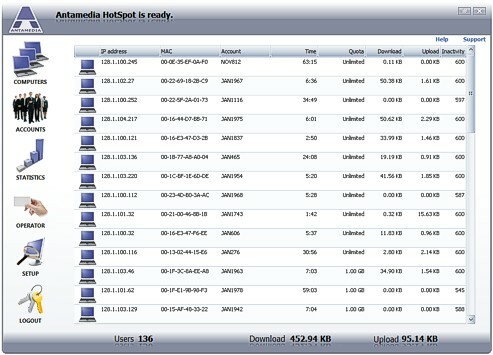 HotSpot is a captive portal software that acts as a gateway – it will accept traffic to one network card, analyze it, and if customer is allowed to browse, it will pass traffic to second network card connected to Internet using preferred line (ADSL, Cable, WiFi…). Zolsoft Office Server is an office automation package consisting of a Web server, a client server, an FTP server, an SMTP server and a POP3 server. A hot application is network drives. It can divide users by workgroups and create workgroup folders. Various access permissions/methods can be set for users. Besides, it can be used to setup file servers for small and medium-sized enterprises and government agencies. It provides you with an integrated office solution that helps share and exchange documents safely, simply and fast. Features: Multilingual support. It supports all Windows versions since Windows 2000. Independent Web server (IIS is not necessary), convenient to use. Independent database, no need to install third-party database engine, reduced investment. Save files in Windows file formats, so no need to worry about compatibilities in the future. Set up different levels of permissions to guarantee data security. Share and exchange files simply and fast. Create many workgroups for the users to manage and exchange files conveniently. Five services: Web, Client, FTP, SMTP and POP3. Three login methods. Set up the capacities for every user’s network drive and mailbox. Backup files for important users or workgroups at specific time(s) automatically.